I have already told you (in this topic: viewtopic.php?f=138&p=8077#p8077) that, when I was a child, I met a woman who, as I'd soon realize, was an Elda (that is: one of the High Elves, as described by J.R.R. Tolkien. Just a real one). What I haven't told you yet is that, as I'd find out later, many people in the world have met Eldar and have spoken with them. Most of these people are like me: reincarnated Eldar who have come into this world to help humanity ("to help humanity do what?" you may ask me. Well, this I'll tell you later because it's a long and complex story. They aren't here to stop wars or to end starvation in one fell swoop, anyway). Others of them aren't like me. No, they are like everyone else, but have been approached by the Eldar for some particular reason. Anyway, all these people get, sooner or later, to know each other. They are kind of a big family and are usually referred to as Calacholiellen (a Mithren - or Sindarin, if you prefer - name meaning "Lightbringers"). I think this is a name the Eldar devised for them. I got to know some Calacholiellen years after my meeting with Nilwen (the lady which I told you about). It was kind of surprising... and yet it wasn't. They are all very secretive, everything they communicate is hush-hush, even if they usually communicate in Mithren. Humankind is not used to consider how far it could go if only it evolved internally rather than externally. Humankind has developed technology, but it has not developed the ability to use the mind. That is why what I'm going to say will surely sound absurd to most of you. Most of the Calacholiellen share information and memories via ósanwë (or gohanu, in Mithren). This word means "communion of thought". That is the way most of us keep in touch, most of the time at least. However, we meet face to face, every now and again (it's not always easy). Being in the presence of a real Elda has been the most fascinating and overwhelming experience of my life. I come myself from Valinor and I know what living there, among Eldar, is like. But those are memories, often distant and a bit vague. So, yes, I feel what any ordinary person of this world would feel in meeting one, more or less. It has been suggested to me that showing you a simple pencil drawing might be a good start, and that's what I'll do. What this image cannot make you understand is that you really feel in the presence of an angel, a creature of light. One of the things you notice first is that any Elda is taller than the majority of humans, sometimes a little taller, sometimes much. Their general appearance suggests an equal presence of both strength and kindness. They can jump to a height of six meters, you know, and do things such as running extremely fast for an entire day (12 hours) without ever stopping and without being tired at the end. Most of them could kill a man with a single gesture of their hand (or finger), but they are extremely kind, playful and often joyful. Anyone of them has the ability to make you feel as if you had just died and found yourself in front of an angel who tells you: "I know, your head is filled with questions. Now just take a deep breath and make yourself comfortable, because I'm going to answer to them all, if you so wish". [...] Most of the Calacholiellen share information and memories via ósanwë (or gohanu, in Mithren). Interesting, what is the method of this communication if I may ask? I am quite familiar with direct communication with the Salvia-people and with some animals I know well, but this ability was given birth and is sustained by contact with my spirit-ally, the entheogen Salvia Divinorum. Luthien and I are always about, and a few others drop by from time to time. Since our inception, we've had problems with new people joining and then not posting. After a while, one gets tired of that sort of thing and tends to check less often. It's really up to the new people to change that if they want to: we're always ready to listen and reply to interesting posts. Interesting, what is the method of this communication if I may ask? I wouldn't say there is a precise method but one thing is sure: if you don't know the basics of the science of spirit you'll never manage to understand the message you receive. Shared words, memories and ideas can be easily mistaken for personal thoughts, at times. You have to know what is generated by your mind and what instead crosses it, but comes from another mind. There is an exception to that: when someone calls you very urgently or when it's an Elda who talks to you through the mind. In both cases - at least in my experience - you risk to have a panic attack, because you hear a clear voice in the room you are in without anyone being in that room. Anyway, a long time ago I thought I was just crazy, but then some friends contacted me via Email and told me - by writing it in the Email - exactly what I was thinking about. And it wasn't something you can easily find out in a normal way, rather something like "Sir ú-radon uchiliad deithad i-had in-rennon nin bedial or Nilwen". A Mithren sentence meaning "Today I can't keep writing that part of my secret diary in which I talk about Nilwen". I mean, these people weren't supposed to be able to speak in Mithren, to understand it. They weren't supposed to know who Nilwen was (neither were they supposed to know I had a secret diary, for that matter). A few years later, I would find out they were my real family. Also, sharing images is more difficult than sharing words or ideas. And making other people see what you are doing in real life at a particular moment requires a complete mastery of the ósanwë. "Sir ú-radon uchiliad deithad i-had in-rennon nin bedial or Nilwen". "Now/today I don't/can't make/find a way [to] ?unfollow the place ?which I remind me ?speaking over Nilwen." "Sîr ú-verin* teithad i-hath* en-orpharf* noll nîn v'i bedin o Nilwen." The convenience of calling it (and claiming that it is) something other than Tolkien's Sindarin is that when a new publication debunks our theories or obsoletes a previously attested approach, you can say that Tolkien was mistaken (or became so, when he changed something), and you don't need to update your understanding of the langauge because "you were speaking correctly all along". But if it is Sindarin, and if Tolkien was right in his findings (and somehow even when he changed his mind), then your way of using his lexicon would be at odds with his own. Now, there is a way to work around this issue, often employed by Otherkin (and especially useful for "fiction-kin" who sometimes stumble upon other people who claim to be the same fictional character), and I am almost certain that you know and use it; the Multiverse, or personal gnostic experiences in which one person could experience "the same thing" in a different manner. In this case, you would have received knowledge of a version of Sindarin whereas Tolkien received another. Yet unfortunately, your usage (or the usage of those who taught you "Mithren") shows clear signs of containing (debunked) theories from the early 2000s when neither the Gnostics nor Tolkien but the Elvish enthusiasts and linguists, for example, came up with a way to give thanks in Sindarin, and it has later been proven to be wrong. Perhaps, in your universe/experience, ancient initial H never disappeared. But then you would need to say h|anna-, h|atha-, H|eglan, H|eglarest, h|eitha-, h|ego, h|ened, h|o... I would be interested in learning how you would explain these. 1 - In Tolkien's Late Notes on Verb Structure (PE22), we see that he switched from √U to √LA for negation, and repurposed "ú-" as "can't" as in Gilraen's linnod "ú-chebin = I can't keep" rather than "I don't keep" like before, hence my usage. 2 - What appears as "-verin" is my neologism *bor- "to continue", from √BOR(ON), cf. Q. voro "continually". 3 - No lenition on teithad as seen in the King's Letter "aníra suilannad = he wants to give greetings". 4 - S. sad (lenited had) is glossed as "place", which may work well enough as "part", but a proper derivation from √SAT (as ancient satta) would be *sath "part, portion". 5 - I came up with *orpharf for "diary", it is a compound of aur+parf "day+book". I simply thought that it would be a fitting way to say "diary", but there could be better neologisms. 6 - In case it is obscure, like its meaning, the lenited noll is in fact [n]doll "(adj.) obscure, dark, dusky, hidden, secret". I'm so happy to meet another Sindarin enthusiast! I see you know PE well... unfortunately we can't use PE to explain the language I was taught. I'm not one of the Otherkin. I met a person who told me she was an Elda, a person who didn't even need to prove she was an Elda. She looked exactly like an Elda, she was able to talk to me through the mind and she shared with me visions of Valinor, of her life and of my "former" life in Valinor. I've been discovering new memories of that life since the moment I met her. One of the first thing I've remembered is being a temporarily reincarnated Elda. The language I was taught by Nilwen is the modern Sindarin, the one which is now spoken in Valinor. The language J.R.R. Tolkien wrote about is instead the Sindarin of Ennor, the Sindarin of 30000 years ago. The same goes for Quenya: the Quenya now spoken in Valinor has evolved, it is much more complex, rich and beautiful (in my opinion) than the Quenya spoken by the exiles of that age. This is what I remember, because in all my memories I speak in modern Quenya or modern Sindarin. The situation in the current Valinor is bilingual: everyone knows both Quenya and Sindarin. Many prefer to use Sindarin in everyday life, but a considerable amount of people use instead Quenya. 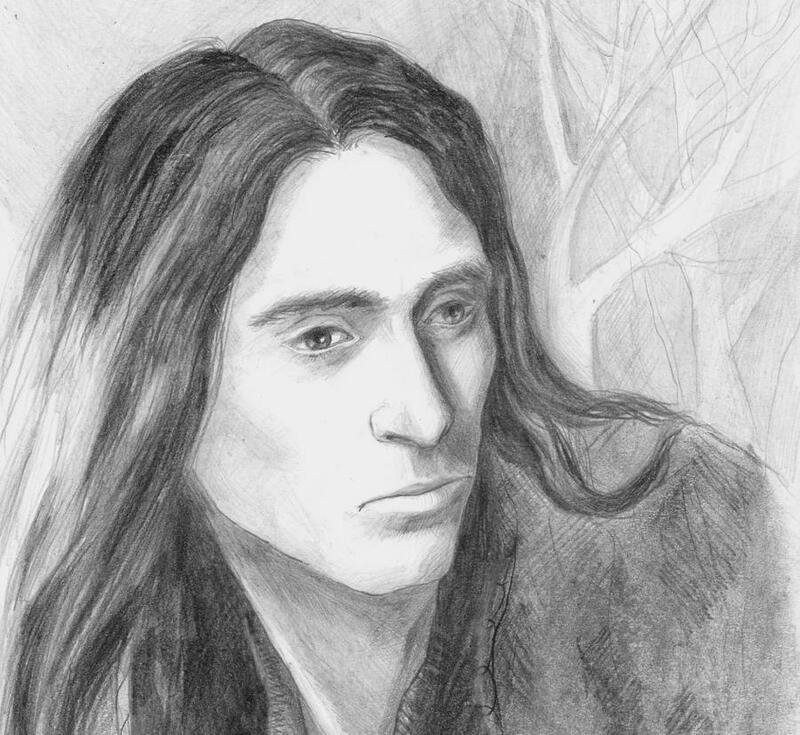 About the Sindarin name of modern Sindarin: Mith or Mitheledh means "Sinda (one of the Sindar)". Mithren is originally an adjective meaning "characteristic of the Sindar (which are called "in-Mith" or "in-Mithelidh"). Nilwen told me that in Middle-earth Sindarin was already called Mithren. radon = I succeed (in)(Literally "I overfly"). > ú-radon = I do not succeed (in). uchiliad = keeping, going on. deithad ( < teithad) = writing. sad = (a) part > i-had = the part. rennon = (a) diary > i-rennon = the diary > i-rennon nin = my diary (which is a secret diary, this is implied) > in-rennon nin = of my diary. bedial ( < pedial) = talking/that tells. Nilwen = Nilwen ("She who will ever be friend"). Dear Elaran... how can I explain? I have no interest in saying that someone is mistaken, certainly not in saying that J.R.R. Tolkien was. I simply learnt a beautiful language, a language which has a name and a history, and I use it to write my diary. I'm not claiming to be in possession of something "more correct" than Tolkien's work, not in any way. Besides, according to Nilwen, Tolkien was not mistaken at all: he simply had been asked by the Council of Elders of Valinor to write about the languages of 30000 years ago: Exilic Quenya, Sindarin, Adûnaic, Soval Pharë and the like. A couple of those languages have now evolved - at least all my memories tell they have - and are different from before. By the way: their evolution is not that predictable. But there is a reason for it: the Eldar have worked on them, consciously altering their natural evolution. - Radon = I succeed. - Ú-radon = I do not succeed. - Hae radon = I can succeed. - Ú-chae radon = I cannot succeed. In Valinor, you see, I was (and am) one of the lambeñolmor. I studied the evolution of languages. I also studied human languages, such as Latin, English and Chinese! your usage [...] shows clear signs of containing (debunked) theories from the early 2000s when neither the Gnostics nor Tolkien but the Elvish enthusiasts and linguists, for example, came up with a way to give thanks in Sindarin, and it has later been proven to be wrong. I already knew that the Mithren way to give thanks coincides with the one displayed in the second film of the Lord of the Rings. Hannon ( = I acknowledge > I give thanks) is the first person singular of the (Mithren) verb hannad ( = To acknowledge). And this verb derives from another verb: haeniad ( = To receive acknowledgement, to be recognized). I can presume that the Mithren verb hannad and a hypothetical Exilic Quenya verb *hanta (I don't remember, from my studies in Valinor, whether it actually existed or not. I only know that Tolkien mentions the word hantalë, which seems to originate from some such verb) are related. And I can presume that David Salo deduced the NeoSindarin root *hanna- from the very same hypothetical verb, or directly from the Quenya word hantalë. This may be the reason why the Mithren "hannon" coincides with D. Salo's NeoSindarin "hannon". Perhaps, in your universe/experience, ancient initial H never disappeared. As I said, Quenya and Sindarin have not evolved in a very predictable way. There are many things that had disappeared (take the difference between the dual ending in -u and the dual ending in -t) and that the Eldar decided to reinstate. They are a stubborn people (especially the Ñoldorin part), when they think something makes their language more beautiful they even go against natural evolution. [...] I'm not one of the Otherkin. Which is why, good sir, I would ask you to please describe these experiences in full detail. If you are worried about privacy in the sense of search engines indexing the content, we can make a completely hidden sub-board accessible only to you and Luthien and myself if you want, or only accessible to trusted members also like Elaran here. Otherwise, it seems (to myself, I don't speak for anyone else) like "false advertising" to claim a large important experience, and then to withhold it. Which is your personal choice, of course. But then that does beg the question of why you joined the forum. So, I ask you to share. Don't worry that it may be "too much" for us - we've pretty much seen it all in the 11+ years this forum has been up on various hosts. I was only trying to explain to Elaran the difference between myself and one of the Otherkin. How could I describe these experiences in full detail? Did you maybe just mean a description of the moment I met Nilwen and her friends? I wouldn't say I'm worried about privacy, no. I joined the forum mostly because I hoped that offering some reflections on topics such as the nature of God and the meaning of life might be (at least a bit) helpful to someone. Also because the Eldar are about to come back to Earth en masse and more people need to know who they really are. I will write it in the next few days. [...] I was only trying to explain to Elaran the difference between myself and one of the Otherkin. I was using this post as a useful segue into the experiences you mentioned in your earlier threads, sorry for not being clearer on that. With all due respect, you're a difficult person for me to get a handle on without using shamanic scanning techniques (which I typically only use if a person is a threat to myself or my family, as they are not pleasant for the recipient) as sometimes you say things that sound 'otherkinish' to me (like the Martian stuff) and yet at other times you say very interesting things that I've verified myself using more scientific techniques, like much of the Legendarium taking place circa 30,000ya, which I've never heard anyone beside myself say. Now, just so that you can understand me clearer, I'm scientifically oriented, but I'm no Richard Dawkins. Or, more accurately I'm what Richard Dawkins might have morphed into had he been born with a shamanic transceiver in his head and activated its more advanced functions in midlife via contact with a very special entheogen, and thus forced to confront the reality of spirits and spiritual forces. So, my request was mainly to present your accounts chronological order in a way that presumes no prior knowledge of what you've said (this, mainly for new or future forum members). Compression is fine for periods of time which may have been blissful, but which may not have had many salient points. Please, feel free to forget that part. I should have just mentioned that Nilwen and her friend Arphin told me that they were an existing species. Is it fine if I summarize in three lines what I've said in my previous threads, in case knowing what I said in them is needed to understand something I put in a new post? What I was thinking is that, for the purpose of continuity in your new thread, to just copy the relevant text and paste them at the appropriate place(s) in your new draft. This is easier to do if you use a separate editor to compose your messages, as I do. It also avoids the board's software timing out if you are drafting a long post and potentially losing the text. This used to happen a lot to one of our senior members (Eruannlass) until we suggested using a local text editor.